The main lobbying group for America's for-profit colleges, APSCU, proposed last year to stock the Department of Education's 28-member negotiated rule-making panel on the crucial "gainful employment" rule with 11 nominees, nine of whom were executives at APSCU-member for-profit college companies, including multiple companies now under investigation by law enforcement. Correspondence obtained from the education department by Republic Report under the Freedom of Information Act shows that APSCU CEO Steve Gunderson, in a 12-page letter dated July 12, 2013, denounced the regulatory process and demanded that the Department halt it, but nevertheless proposed a slate of nominees for the panel, including executives at EDMC, ITT Tech, Career Education Corp., DeVry, Bridgepoint, Alta, American National University, Porter and Chester Institute, and Daytona College. Separate correspondence reveals that the U.S. Chamber of Commerce, another opponent of the gainful employment rule, nominated the same Bridgepoint executive, Vickie Schray, put forward by Gunderson, as well as the Chamber's own vice president of education policy. Although the Department placed on the gainful employment panel four representatives of for-profit colleges, only one of the four, Daytona College Vice President Justin Berkowitz, was one of APSCU's nominees, and neither of the Chamber's picks was selected. 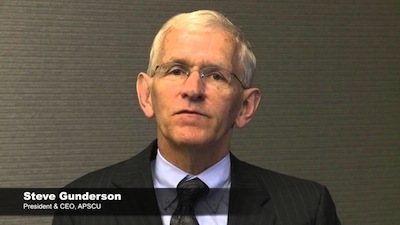 The Department's panel selection led to a vitriolic response letter from Gunderson, dated August 26, 2013, which APSCU posted on its website. In the letter, Gunderson repeated previous demands that the Department abandon the gainful employment rule-making, and leave matters in the hands of Congress. (Relentless lobbying and generous campaign contributions from APSCU and its industry to Members of Congress has ensured that there will be no effective legislative response to the misconduct of predatory for-profit colleges, which leave many students deep in debt and unemployed.) Gunderson's August letter charged that several panel members "are on-the-record opposing the private sector or work for entities that are opposed to the existence of our institutions. As a result, the committee neither fairly nor adequately represents our students and institutions; rather, it is composed of vocal opponents of our sector. ... Indeed, the composition of the rulemaking committee is so biased and one-sided as to call into question the Department's intent to fulfill its obligations ... to engage in a fair process..."
By letter to Gunderson dated September 6, 2013, Lynn B. Mahaffie, acting Deputy Assistant Secretary, defended the Department's panel selections and its decision to move ahead with rule-making. "We look forward to working with all members of the committee, including your nominee, Mr. Justin Berkowitz," Mahaffie wrote. In his July letter, Gunderson also nominated for the rule-making panel an executive of PEAC Student Loan Assistance, a company whose direct pitch to colleges is that it "offers loan management and default prevention services that can lower Student Default Rates in just 90 days." Colleges with consistently high student loan default rates risk losing their eligibility for federal aid, and many for-profit colleges hire outside companies to manage students' debt and help keep reported default rates down. PEAC is also a member of APSCU. In another letter to the Department obtained by Republic Report, U.S. Chamber of Commerce executive vice president R. Bruce Josten declared the Chamber "deeply troubled that neither of its nominees ... was selected," even though he acknowledged that the panel did include "a member of the U.S. Chamber with expertise in veterans employment issues..." (a reference to Ted Daywalt, president of VetJobs). What is striking is that APSCU not only demanded a super-sized contingent of for-profit college representatives on the panel but also proposed for membership some of the most abusive for-profit college companies -- companies whose high prices and poor efforts often leave students worse off than when they started, and companies now being sued or probed by federal and state law enforcement. These large publicly-traded companies are the ones that dominate APSCU -- so much so, apparently, that Gunderson felt compelled to nominate them, rather than officials from more palatable, well-performing schools. EDMC, now under investigation by more than a dozen state attorneys general, and facing a lawsuit from the Justice Department charging that the company defrauded taxpayers. ITT Tech, sued this year by the Consumer Financial Protection Bureau for misleading and coercing students into taking out private student loans, and also under investigation by the Securities and Exchange Commission and more than a dozen state AGs. Career Education Corp., also under investigation by the SEC and a dozen-plus state AGs. DeVry, under probe by at least three state AGs and the Federal Trade Commission. Bridgepoint, probed by the SEC and facing investigation or ongoing oversight by at least five state AGs; this is the company whose school Senator Tom Harkin called "an absolute scam." In other words, Gunderson was proposing that a group of foxes write the rules for the henhouse.